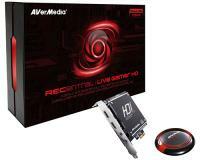 The Live Gamer HD can capture your local PC gameplay without draining system resources. Now you don't need to set up another PC just for recording game footages. With the Live Gamer HD, your game machine is also the gameplay library. No more hotkey conflict! The accompanying Hot Button helps you fire up the Live Gamer HD timely and preserve the most exciting in-game moments precisely. The RECentral software allows you to record your voice commentary along with the in-game footages to make your walkthrough video more impressive. Even better, you can record your voice whenever you want to regardless of the gameplay recording. The RECentral also can help you broadcast your live gameplay on TwitchTV and receive applause from the whole world. Convenient one touch button record / stream - also lets you know when it's recording !